A resident of New Orleans is three times more likely to be killed than someone living in a similarly sized U.S. city. Gun violence killed 175 people in New Orleans in 2016. In the first 18 days of 2017, a shooting occurred, on average, every 9 hours. Many of these killings occur in impoverished areas often affected by the drug trade. “When you are working at McDonald’s making $7 an hour, and you can go make $500 in an evening selling drugs, that’s a big problem,” Jennifer Dupree, New Orleans Police Department Second District lieutenant, said. For some Tulane students, these trends may seem far removed from the university’s Uptown campus. Tania Tetlow, former federal prosecutor and current Tulane chief of staff, has seen how this misconception affects both the Tulane and black communities. Dupree said she believes Tulane students can play a role in violent crimes related to drugs, especially when they enter territories and neighborhoods with which they are unfamiliar. According to Tulane University Police Department Superintendent Jon Barnwell, students put themselves and those around them at risk when they purchase illegal drugs. When students are victims of crimes, “nine times out of 10, it has to do with them buying drugs,” Dupree said. When gun violence does affect the Tulane community, it is mostly through armed robberies. Two armed robberies have occurred in the Uptown Tulane community since Dec. 9, 2016, according to the TUPD crime log. In October 2015, an armed robbery occurred in the Lavin-Bernick Center for University Life. Freshman Charlotte Pearson, an alumna of New Orleans’ Ben Franklin High School, said she believes students have a tendency to think that Tulane is not a part of the violent culture in New Orleans and thus engage in reckless behavior. “But that really makes us more of a target for crimes such as armed robberies and possible shootings,” Pearson said. Twenty-six percent of people ages 18-29 own a firearm in the United States, according to the Pew Research Center, and some Tulane students are part of that statistic. “I know students … who have guns, and they’ll take them out when they’re drunk or on drugs and that’s a little bit more concerning,” junior Margot Palandjian said. The impacts of gun violence reached Tulane when Tiffany Thomas, a Sodexo employee and Tulane community member, was shot and killed in New Orleans East in January. Though Tulane students may feel some vulnerability to gun violence, Tulane and TUPD attempt to ensure that students are prepared for the statistically unlikely event of gun violence on or near campus. Dupree said that in her five years in the Second District, which encompasses the Carrollton and Uptown communities, collaborations between TUPD and NOPD have significantly reduced rates of armed robberies near campus. Barnwell said tactics for preparing students for cases of gun violence include active shooter training, Crime Alerts and TUPD-sponsored classes. 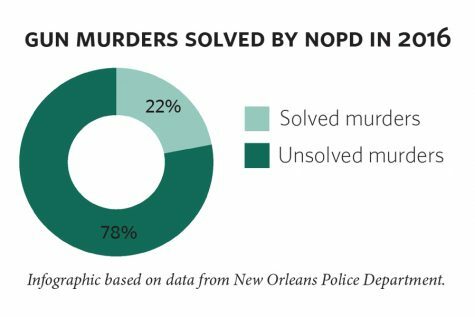 Despite occasional incidents, the gun violence prevalent in New Orleans does not affect Tulane students in the same way it affects other communities in the city, mostly because of the Uptown area’s demographics. Vice President for Student Affairs Dusty Porter said he agrees that students generally do not see the effects of gun violence on campus since it largely impacts black communities. 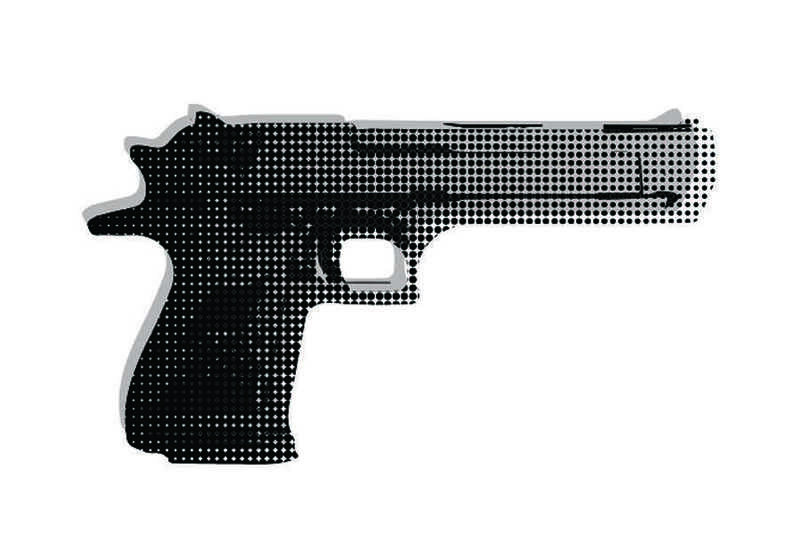 The issue of gun violence has not gone unnoticed by city officials. On Tuesday, NOPD launched the Tactical Intelligence Gathering and Enforcement Response, or TIGER unit, which deploys detectives to investigate armed robberies in the city. NOPD also plans to implement new systems and technology allowing for proactive patrolling. New Orleans Mayor Mitch Landrieu launched the NOLA for Life campaign in 2012, which is a city-wide initiative to prevent killings and violence in the city. To date, the foundation has raised more than $1.3 million. NOLA for Life is not alone in its mission to combat gun violence. Organizations such as Silence is Violence and Moms Demand Action for Gun Sense in America address issues of gun violence in New Orleans, tackling subjects such as conflict resolution, advocacy, education and gun law reform. Despite efforts by these organizations, gun violence persists in New Orleans with 15 people killed in February. Silence is Violence Executive Director Tamara Jackson said she believes this is aggravated by a visibility deficit advocacy groups face within the community. Silence is Violence offers logistical and supportive services to victims of gun violence and their families in New Orleans. It works to ensure that victims know their rights and can navigate the criminal justice processes. Cort, who has worked with MDA and Stop Handgun Violence, said she felt it was disheartening to see gun violence continue to persist within the city. 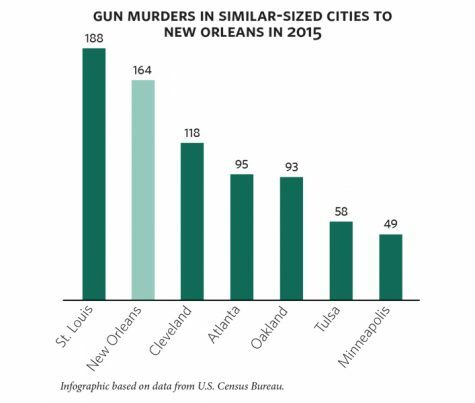 Experts, statistics and community stakeholders suggest that the prominence of gun violence in New Orleans stems from other complex issues of society. Brandi Doyal contributed to the reporting of this article. Disclaimer: Lily Milwit has volunteered for the New Orleans chapter of Moms Demand Action.